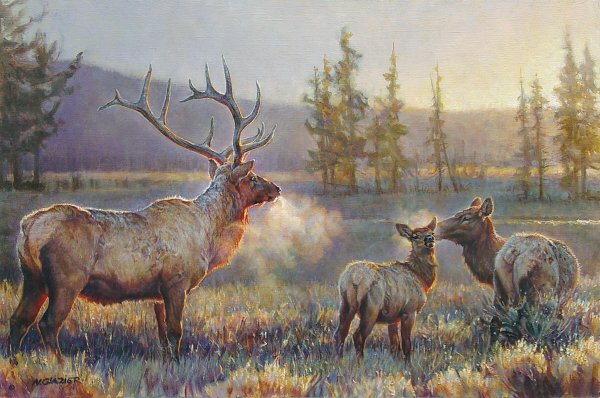 "This painting of elk depicts my favorite country (the northwest), favorite season (fall), and favorite time of day (morning)...so, if a viewer feels the energy of 'Morning', that's where it comes from...I could feel the crackling air, and the sun beginning to melt frost while I painted, and hope to have transferred these memories,(in a way that I cannot explain, and am continually amazed at) into this painting. My absolutely prime focus, as an artist, is on LIGHT and atmosphere, with, barely second to that, a desire to bring the animals and people in my paintings to vivid life, with particular interest in relationships and interactions. I am also allowing myself the joy of looser brushwork, especially in the background, and exciting three-dimensional textures in the foreground, helping to set off the closer focus on the animals and people who are at the heart of what I do. In the past 10 years I have been trying many new things artistically, including learning to paint with both left and right hands (not together! ),and greatly expanding my color palette. If I had to put myself within a statement, it would be something like this: "This artist desires to bring light and joy into people's lives, cultivating it first within herself, by continually seeking excellence of expression."